There is a growing chorus of voices claiming climate change will foster more conflict and violence. Books have been released on the impending age of climate wars, while media outlets dutifully report on research that purports to show how global warming will increase violence of every form, from the number of times pitchers bean batters in baseball to the rate of sexual assault. But is this relationship between climate change and conflict set in stone? Could we leverage changes to the environment to promote peace instead? According to one group of researchers, the answer may be yes. In the near future, it seems likely most people will encounter climate change through disasters and extreme events. Evidence suggests the number and scope of natural disasters has increased significantly in the last few decades. 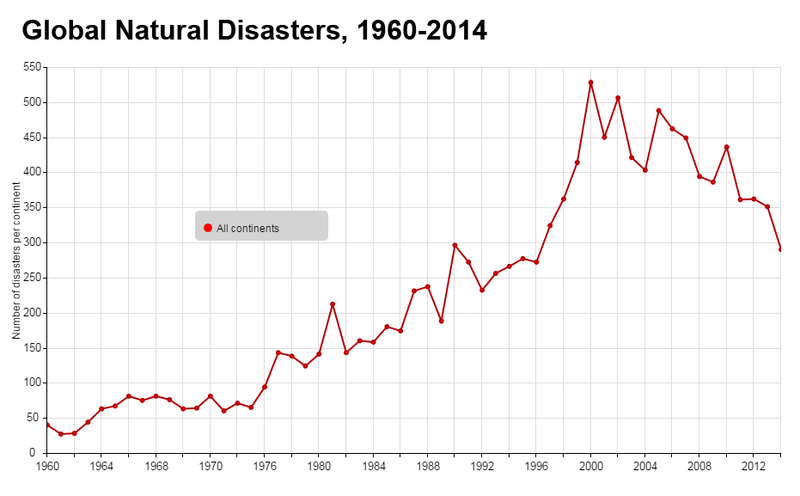 According to data from the Emergency Events Database, the world averaged 58 natural disasters a year during the 1960s. From 2000 to 2010, this number increased nearly eightfold to 449 per year. While some of this spike stems from the combined effects of economic growth and demographic changes putting more people and property at risk, a recent study has also linked the trend to climate change. Accordingly, it may seem we are likely to see a more violent planet in the wake of climate-driven droughts, floods, and heat waves. The concept of disaster diplomacy, however, asserts otherwise: that disaster response can be an opportunity to create positive change in societies and between countries. Introduced by Ilan Kelman and Theo Koukis in a special edition of the Cambridge Review of International Affairs in 2000, disaster diplomacy recognizes that while natural disasters may reinforce inequalities and trigger conflicts, they can also provide a mechanism to break down existing social cleavages and foster goodwill among the affected, even among nominal adversaries. Disaster diplomacy theory builds upon earlier research, particularly the work of sociologist Charles E. Fritz, who argued in 1961 that disasters can contribute to the emergence of a “community of sufferers.” Because serious disasters can affect large numbers of people living in the same communities, they may engender a sense of solidarity and unity of purpose among survivors. At least in the immediate aftermath, all survivors share a common goal – rebuilding their lives. This shared experience can alter social relations and help bridge existing divides. There is considerable evidence that humans are naturally inclined to cooperate with one another when catastrophes strike. One can find evidence of this around the globe, from survivors of the Haiti earthquake moving rubble with their bare hands to rescue strangers, to the thousands of doctors, nurses, and health workers who volunteered to endure grueling conditions during the worst Ebola epidemic in history. According to Jack Hirshleifer, the late, renowned economist from UCLA, humans have evolved to cooperate and share our limited resources during such periods of scarcity. This learned response has been essential to our survival as a species. So where has disaster diplomacy worked? Kelman, now a professor at University College London’s Institute for Risk and Disaster Reduction, maintains a near encyclopedic list of case studies (full disclosure: this list includes a study I wrote on Cyclone Nargis, which struck Burma in 2008). One of the first and best known cases involves Greece and Turkey, two countries which share a long history of conflict and discord. In August 1999, a severe earthquake struck Izmit, Turkey. Within hours, Greece became the first country to offer its support. In addition to financial assistance, Greece rapidly deployed its emergency response team to provide search and rescue support. Less than a month later, a category 5.8 earthquake occurred near Athens. Turkey quickly reached out to the Greek government and dispatched its own search and rescue team. These mutual shows of support dramatically improved relations between the rival states. That December, Greece dropped its opposition and formally supported Turkey’s candidacy for the European Union. Another prominent case is that of Aceh, an Indonesian province located on the island of Sumatra. Aceh was the center of a separatist conflict led by Gerakan Aceh Merdeka – the Free Aceh Movement. This group waged a 30-year-long guerrilla war against the Jakarta government in an effort to establish an independent Acehnese state. But Aceh also found itself at the epicenter of the 2004 Indian Ocean tsunami, which heavily damaged the restive region, killing more than 220,000 people. In the aftermath of the disaster, there was a rapid influx of relief and reconstruction assistance from around the world. The flood of attention helped internationalize the Aceh conflict, which had largely stayed below the radar, fostering the necessary space for peace negotiations. Just one month after the tsunami, the Indonesian government and Free Aceh Movement leaders met in Sweden to negotiate an end to the conflict. That said, disaster diplomacy is far from a silver bullet. Consider Sri Lanka. Like Aceh, it was home to a long-running separatist movement, and, like Aceh, it suffered severe damage from the tsunami. But, whereas insurgent leaders in Aceh saw the tsunami as a reason to put down their weapons and return to the negotiating table, the leaders of the Tamil Tigers viewed Sri Lanka’s response to the disaster as further evidence the government was discriminating against the Tamil minority. Both sides resumed hostilities, and the war only ended in 2009 after a violent campaign by the Sri Lankan government, which likely included crimes against humanity. Other instances which would seem ripe for disaster diplomacy have fallen short. Disasters have continually failed to help bring peace between India and Pakistan, for instance. In May 1965, a major cyclone hit southern Pakistan in the midst of its second war with India over Kashmir. The storm killed 48,000 Pakistanis and the two sides reached a ceasefire shortly thereafter, but the arrangement was short-lived and full-scale hostilities resumed by September. India and Pakistan also squandered similar opportunities to reach détente over Kashmir following the October 2005 earthquake and last fall’s devastating floods. What separates the Acehs from the Sri Lankas? According to a 2006 study from Kelman in the Journal of International Affairs, effective disaster diplomacy requires four things: the talks must be disaster-related; they must be new; there must be legitimate efforts by both sides to end hostilities; and the actions must last beyond the short term. If these elements are not present, diplomacy may fail. Other researchers disagree somewhat with Kelman’s assertion that diplomatic overtures should be new. In a 2010 paper, Marco Pelling and Katherine Dill outline the ways in which disasters can become tipping points for altering the social contract between citizens and the state. They argue that while disasters may provide momentum for diplomacy, they are not catalysts in and of themselves. Instead, the push for political change must have been in the works before the catastrophe. Failing this, disasters may simply create an “accelerated status quo” that reinforces the existing political structures. Here, it’s important to note that in Aceh, the rebels had actually begun backdoor discussions with the Indonesian government before the tsunami hit. The opposite was true in Sri Lanka, where the Tamil Tigers had pulled out of peace talks just months before the disaster. Clearly, disaster diplomacy is a useful concept and could provide a framework to turn a negative – the upswing in disasters brought by climate change – into something positive. At the same time, it may not be wise to place faith in the concept without pre-existing political frameworks. And certainly we don’t want to be wishing for disasters in conflict-affected countries. Sources: Cambridge Review of International Affairs, Climatic Change, DisasterDiplomacy.org, Dwyer (2011), Emergency Events Database, Global Change, Peace, and Security, Intergovernmental Panel on Climate Change, Journal of Environmental Economics and Management, Journal of International Affairs, Mother Jones, Psychological Science, Reuters. 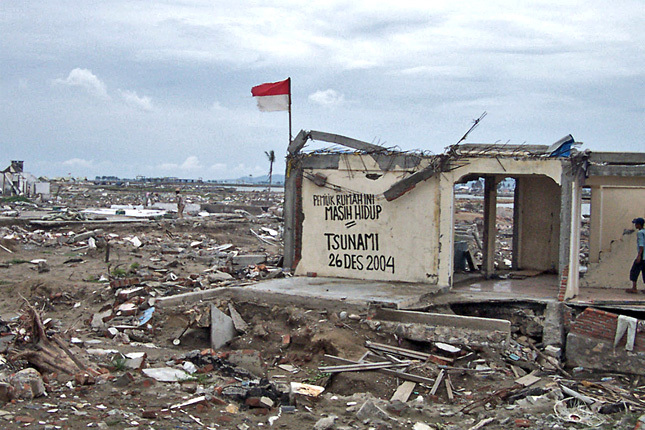 Photo Credit: Wreckage in Aceh, Indonesia, after the 2004 tsunami, courtesy of flickr user Eddo Dadyka.